Mr. Phelps has been at WCS since 2013, teaching social studies, technology, and language arts, and religion. He is also the 7th grade homeroom teacher. He received his B.S. in Social Science Education from the University of Southern Indiana in 2012, and is currently working to get his Masters from Ball State University. 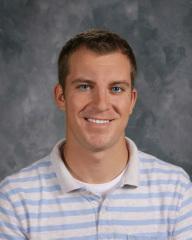 Mr. Phelps is a proud westsider and a graduate of Mater Dei High School (2007). In addition to his career in teaching, Mr. Phelps has also served as an assistant football coach at Mater Dei since the fall of 2007, and is currently the head Junior Varsity football coach. When he is not teaching or coaching, Mr. Phelps enjoys exercising, working in his yard, and spending time with his wife Jenna, daughter Hunter, and their dog Yuri.